>Right well I’ve gone as far as I can for now. This is it at the moment. 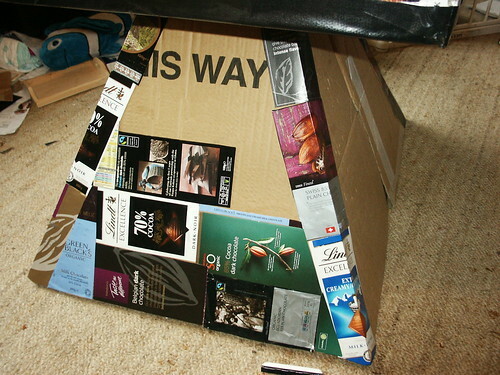 I’m still eating chocolate and my Mum and Brother have offered to post down some more wrappers so I can finish off decorating the sides of the pyramid. It’s a bit frustrating as I know it’ll look different with no brown cardboard showing. 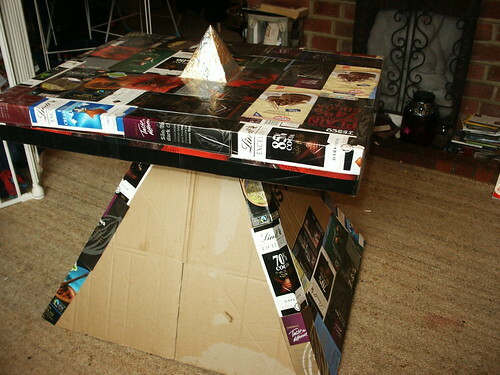 The top is glued on and appears to be very stable. I’ve covered it with sticky black plastic to keep it safe from spills. For reference I spent £2.99 on wood glue and used some black gaffer tape and sticky back plastic that I already had around. I used a pair of scissors, chisel, hammer, file and tenon saw. The rest of it is quite literally rubbish. Or more accurately recycling. It’s just that I’m temporarily detaining it here before it goes on to be recycled. All the decoration is chocolate bar wrappers. 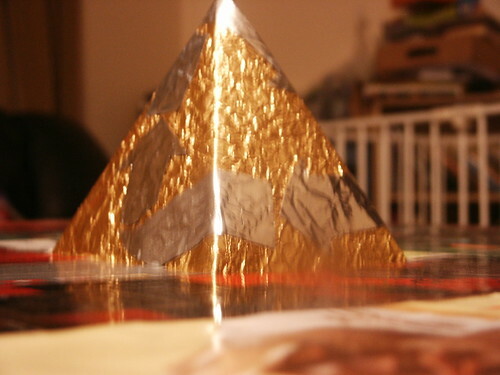 Even the foil on the pyramid came from chocolate bars. This is the pyramid face, eventually it’ll go all the way up. Here is the Chocolate Pyramid in all it’s glory! Here’s the best shot I could get of the wrap-around recycling symbol in two tone foil on the centre pyramid. So there we are. Comments please?